Although Jews had lived in Hot Springs as early as the 1840s, they did not organize a congregation until the 1870s. As early as 1872, a group of Hot Springs Jews began to worship together. Three years later, ten Jewish families officially formed the town’s first Jewish congregation and began meeting in a rented room. In 1876, they purchased land for a cemetery. Calling themselves the House of Israel, the group constructed their first synagogue in 1885 at a cost of $550. Conflict was not unusual during these early years. Two of the founding members were expelled from the congregation for using “revolting” language during a disagreement. The conflict reached the pages of the American Israelite newspaper, whose editor supported the congregation’s decision to kick the offenders out of the group. Early on, the congregation adopted Reform practices and decided to join the Union of American Hebrew Congregations. 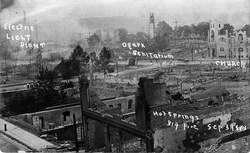 This young congregation suffered a series of disasters worthy of Job, including destructive fires in 1896, 1905, and 1913, as well as a flood in 1924. As a result, very few records remain from the congregation’s early years. After their building was destroyed in 1896, they held services at the First Methodist Church while a new synagogue was built. This new building was burned in the great fire of 1905, which destroyed 33 city blocks. The congregation decided to move to a new location, purchasing a lot on the corner of Quapaw and Market streets, which remains the site of the congregation today. Congregation member Henry Goodman served as lay leader when the young congregation did not have a rabbi. House of Israel hired Frank Rosenthal as its first full-time rabbi in 1894. Rabbi Rosenthal served the congregation until 1901, when he was replaced by E.L. Schreiber, who only stayed for a year. In 1902, Hot Springs had the good fortune to hire a young man named Abraham Benedict Rhine who had just been ordained by Hebrew Union College. Rabbi Rhine spent his entire thirty-nine-year rabbinic career in Hot Springs, which is the longest continuous rabbinic service in Arkansas Jewish history. Born in Lithuania, Rhine became an important figure in town, serving on the local school board for sixteen years, and was involved in numerous charitable associations. He also was instrumental in the construction of the Leo N. Levi Memorial Hospital, which was founded to assist indigent Jews who had come to Hot Springs seeking a cure for their bone and blood diseases. Rhine served as the hospital chaplain for many years. In 1931, Rabbi Rhine organized the Arkansas Jewish Assembly to bring the state’s congregations closer together. They held annual meetings for decades. With the exception of Rabbi Rhine’s long tenure, most of House of Israel’s rabbis stayed only a few years. After Rhine retired in 1941, the congregation had five different rabbis in a fifteen-year span. Rabbi Albert Michaels served the congregation from 1956 until 1974. It is remarkable that the small congregation was always able to hire a rabbi, despite the high turnover in the position. Rabbi Selvyn Goldberg, who arrived in 1974, was very popular in the community. He spearheaded the effort to built Levi Towers, a convalescent home for elderly residents located next to Levi hospital. When he died suddenly a few days before Yom Kippur in 1981, his close friend, the pastor of the First Baptist Church, read Rabbi Goldberg’s Yom Kippur sermon to the congregation. After Goldberg’s death, House of Israel has gone extended periods without a full-time rabbi, relying on student rabbis from Hebrew Union College. House of Israel’s sisterhood was originally founded as the Ladies Aid Society. It helped needy families with monthly assistance at a time when there was no welfare or social security system. In 1912, it joined the National Federation of Temple Sisterhoods. Fannie Fellheimer served as the society’s president for 25 years. The sisterhood ran the religious school, paid its teachers, and helped to refurbish the sanctuary. After World War II, House of Israel grew as the local tourism industry flourished. 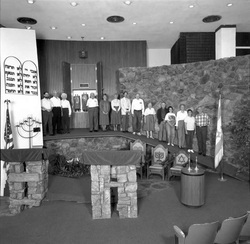 In 1957, they built an addition to their 1905 synagogue, which included a rabbi’s study, classrooms, and an auditorium named Burgauer Hall. In 1961, the congregation decided to tear down their old sanctuary, and held services in Burgauer Hall while a new one was constructed. In 1965, the new sanctuary was completed. While House of Israel has been in existence for more than 130 years, Hot Springs also had two different short-lived Orthodox congregations. In 1907, a group of thirty Orthodox Jews founded Shearith Israel (Remnant of Israel). S. Zidman led weekly Shabbat services as cantor. They had ten children in their religious school in 1907. Shearith Israel relied heavily on the Orthodox Jewish tourists who came to Hot Springs for treatment. The congregation had disbanded by the 1930s. After the demise of Shearith Israel, Orthodox Jews continued to pray together informally. In the 1940s, they met regularly in a second floor apartment above a liquor store in downtown Hot Springs. 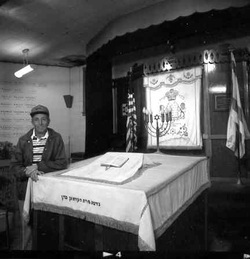 In 1950, this Orthodox group, now calling themselves Beth Jacob (House of Jacob), built a small synagogue on Quapaw street just one block down from the House of Israel. Once again, the Orthodox congregation relied on the support of northern Jews who came to Hot Springs for medical treatment and recreation. By the 1980s, Beth Jacob only met on the high holidays with a cantor they brought in to lead services. Eugene Kirsch was the leader of the congregation at the end. The congregation never had a full-time rabbi. Eventually, most of Beth Jacob’s remaining members also joined House of Israel. When Beth Jacob finally closed in 1993, they transferred their artifacts, funds, and holdings to House of Israel. 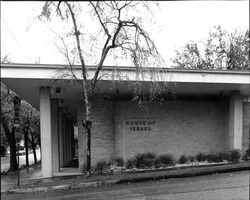 Today, House of Israel is the only Jewish congregation in Hot Springs. With sixty-eight families, an active religious school, and a full-time rabbi, the congregation continues to thrive as the center of Jewish life in Hot Springs.